at once, & R-clicking on one - then selecting 'Photo Gadget Picture Resize'. Description: Photo Gadget is a free tool designed to eliminate the use of complicated and expensive software in such a simple task as resizing pictures. Its purpose is to make the process of resizing many pictures at once incredibly easy. Installation: To install Photo Gadget double click on PHOTOGADGET.EXE and follow instructions on the screen. 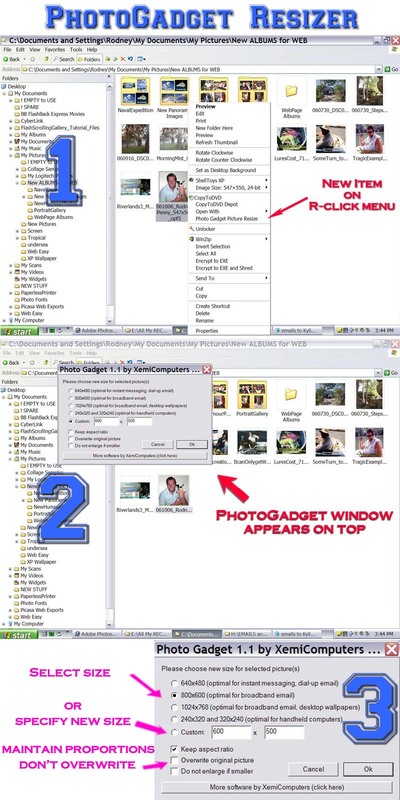 To uninstall go to Control Panel - Add/Remove programs, find Photo Gadget in the list, select it and click Remove. You may choose one of four standard sizes, 640x480, 800x600, 1024x768, 240x320 (320x240) or you can set some custom picture size. If you need to resize your pictures to some other size, choose Custom picture size option and type in new size in pixels. To keep proportions of the original image make sure that Keep aspect ratio option is checked. 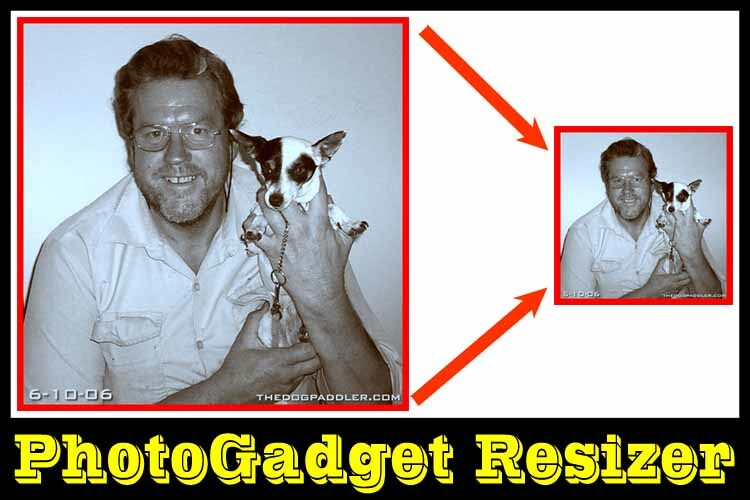 By default, Photo Gadget won't enlarge your pictures. Increasing the size of a picture causes a loss in its quality. If you still want to increase the size of your picture, turn off Do not enlarge if smaller option. Photo Gadget will by default save your resized picture under new name that will include its new size information. If you want Photo Gadget to overwrite the original picture, turn on the option Overwrite original picture. If you select more than one picture for resizing and choose 320x240 from the list the program will pay attention to each picture's orientation and resize it accordingly, landscape pictures to 320x240 and portrait to 240x320. If you want all pictures to fit to only one of those two sizes regardless their orientation then use Custom picture size option instead.